Dive Into GraphQL Part I: What's Wrong With REST? This is the first post in the Dive Into GraphQL Series. Surprisingly, this post will not talk about GraphQL itself, but about the problems it solves. And they mostly boil down to REST. Update 25/09/17: Fix inaccuracies in the way multiple HTTP requests affect browser performance, and missing HTTP/2 mention. REST, invented in 2000 and popularized in 2007, shined because of its simple syntax. REST made requests and responses easy to build and parse, which is why frontend and backend developers around the world adopted it quickly. REST was also stateless and cacheable, which made scaling a piece of cake. It worked so well that today, API centric architectures are everywhere, and REST is the tooling of choice. But the world has changed since 2007. And the few shortcomings of REST, which were a good trade-off back then, are now a big pain for productivity, performance, and maintainability. In 2015, Google announced that for the first time, it had received more searches from mobile devices than from desktop. Since then, mobile Internet consumption has progressed steadily as developing countries jumped on the mobile Internet bandwagon, skipping cable connection altogether. So let's face it: the web apps that we're building today will be mostly used on mobile devices, and not on WiFi. Mobile devices over 4G or 3G are slower than on WiFi, because the latency overhead of radio communication oscillates between 100ms and 600ms on 4G (up to 3500ms on 3G), and also because the quality of mobile connections varies a lot, which affects throughput in addition to latency. For a single HTTP request, the response time dangerously approaches 1 second, which is the user's flow of thoughts limit according to UX expert Jakob Nielsen. That means that the maximum number of HTTP requests a mobile app can make without losing the user's attention is one. Let's not forget battery life. Radio communications are power hungry, so mobile devices turn off the device radio as soon as possible, losing the channel they had established with the radio tower. To make a new HTTP request, a mobile device must wake up the radio, and request some bandwidth to the radio tower. This can drain the battery pretty quickly if app designers don't count their HTTP requests. API-centric applications particularly suffer from latency and battery life on mobile, because they query their REST backend like crazy. That's 6 HTTP requests - not even counting the requests for the avatar images, or the embedded media. Request 4 and 5 must wait the return from request 3. So that simple page will require more than 1 second to grab the data it needs, even though mobile browsers can make between 4 and 6 concurrent HTTP requests. Besides, web and mobile apps tend to use more than one service provider (understand: more than one HTTP domain). It's very common to see applications rely on different REST providers for authentication, avatars, comments, analytics, etc. The latency problem becomes even more painful in this case, because each new domain requires a specific DNS lookup, and the HTTP client can't share keepalive connections between domains. To summarize, the main downside of REST is that it makes clients slow by default, especially on mobile. This allows to merge requests 3, 4 and 5, but that's all. Data inclusion doesn't allow to request aggregates of unrelated data (like tweets and notifications). For purists, this batch endpoint is not RESTful at all, since it doesn't really expose a resource. In addition, it doesn't work when you need to pipe the response of one call (e.g. the list of tweets) to another one (the tweet authors profiles). Lastly, implementing the batch endpoint strategy takes time. It's basically like developing a proxy server. I know it because marmelab has developed a Node.js middleware that does just that, called koa-multifetch. That's a component that every application developer should include in their REST server in order to reach a decent level of performance. That's why developing a fast mobile app is so expensive. REST is not a standard, it's an architectural style, a set of loose principles. These principles leave a lot of latitude to developers for implementation. For instance, the recommended HTTP response code for a DELETE request can be either 200 or 204. As for pagination, you can use either a page query parameter, a Content-Range header, or, why not, limit and offset. The lack of unique REST standard for queries and responses caused the explosion of REST standards: Open API, OData, Hydra, JSend, etc. When you need to query a web service, you can't just use a standard REST client, because there is no such thing as a standard REST client. You must either build a custom REST client from scratch, or tweak a highly configurable and highly complex general purpose REST client. Either way, this takes time. And when you need to develop a web service backend, you can't just use the REST framework for your language. You must first spend a week in discussions with all the developers and software architects around you, and try to decide which REST flavor you should use. Oh, and don't get me started on content type negotiation or HATEOAS. So yes, freedom leads to diversity, but in the case of data communications over the Internet, diversity means waste. The lack of REST standard impacts the speed of development a great deal. REST doesn't have the notion of schema, a contract that describes exactly what a web service is supposed to return. Just like with standards above, the absence of schema leads to the multiplicity of possible documentation formats: JSON Schema, RAML, Swagger, etc. In many companies, backend developers still use a Word document to describe the resources and fields of their API. There are so many things to describe in an API contract that hand-made specifications are often incomplete. They lack description of error cases, data types, boundaries for arguments, etc. And they take ages to write, so they are always outdated. The thing is, without a clear contract describing the API, frontend and backend developers must make assumptions until they plug their components together. The more assumptions they make, the longer the integration phase lasts. The absence of a single schema in REST causes delays in development and frustration to developers. APIs tend to change over time. But if the server API changes, all the consumers break. The usual solution is called versioning: the server exposes several versions of the web service, and for a given version, the API never changes. 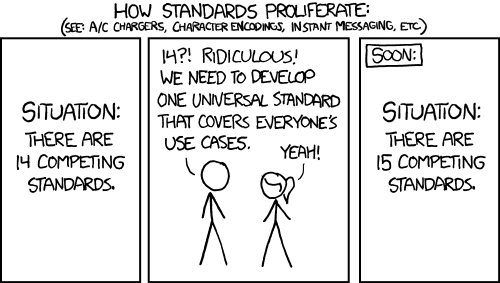 Of course, there is no standard for REST versioning, but we've already talked about that. As for the service consumers, they should be informed about the new release, and spend time updating their API calls. However, Agile software development leads to shorter release cycles. These days, a popular web service can easily change several times a month. Asking developers to change the code of their service consumers so often is not an option. Until a new Product Manager (they change every 6 months) changes the UI completely in order to support name suffix, because the new boss insists on being called Edwin Denison Lowell, III. As the end users will upgrade their apps gradually, it's important to support the previous name format, too. OK, let's add more fields. "full_full_name": "John W. Doe Sr."
The problem is that the longer a web service lives, the larger the resources become. In the Twitter API, a tweet consists of more than 30 fields, most of which you don't need if you want to display the top tweets about your company on a TV set in your meeting room. But REST only contains the notion of resource - there is no notion of fields that you could use to, for instance, restrict the response to only the details you need. Attempts at mitigating this (sparse fieldsets, partial responses) exist, but they're always optional. The default rule in REST is to require an entire resource, with all the fields. So REST web services become slower and slower over time, because their responses become heavier and heavier. REST is modeled after HTTP. It uses the HTTP verbs (GET, POST, PUT, etc. ), requires HTTP transport, and suffers from the same performance and security problems as HTTP. Even if Roy Fielding's original REST paper describes REST as protocol agnostic, REST is de facto HTTP only. Also, most of the discussions about REST describe CRUD (Create, Retrieve, Update, Delete) interactions only. For other communication scenarios (file upload, commands, remote procedure call, etc), you're on your own. Client A sends a GET /events request to a central server every 10 seconds or so. Server A sends a POST /subscriptions request to the central server, with a callback URL of http://serverA.com/remote_events as parameter. client B sends a POST /events request to the central server, with an event in the body. The central server sends a POST /remote_events to server A, with the event in the body. But how do you do that if client A is a mobile device? Does that imply turning every smartphone into a web server? It's not a viable solution. Modern protocols like WebSockets or HTTP/2 solve one part of the problem (the protocol), but they don't specify the data exchange format to use. And REST feels out of place for Pub/sub with these protocols. For instance, WebSockets doesn't have the notion of verb like HTTP - just messages. As a result, applications often use other architectures (like WAMP) in addition to REST to handle these scenarios. To summarize, the REST architecture makes applications slow, harder and more expensive to develop, and too limited in functionality. These problems are real. Many companies suffer from REST, and many have tried to find a better alternative. Maybe we can patch REST by adding all that it lacks: HTTP/2 for request multiplexing, batch endpoints, sparse fieldset selectors, schemas, Swagger documentation, etc. There are entire frameworks like API platform dedicated to this task. My opinion is that it’s like trying to eat soup with a fork. You may manage to do it eventually, but is it really a good idea? I consider that REST doesn’t really match modern web apps requirements. And that's unfortunate, given how much Marmelab, my company, has invested into REST. If you think you can address the limited functionality shortcoming by using plain old Remote Procedure Call (RPC), you're on the right track. But the risk is to fall back to SOAP, and nobody wants to fall into the pit of utmost complexity again. Google invented Protocol Buffers to address the performance and schema pain points, and made it public in 2008. It's a language-neutral, platform-neutral extensible mechanism for serializing structured data. That's a good solution, but it does not address the problem of complex queries and aggregations. Nor does Apache Thrift, another binary protocol for RPC. I believe that an innovative tool recently published by Facebook solves this problem (hint: it starts with a G). Read the next post in this series to discover what it looks like.